Scientists who have discovered a gene linked to autism believe they can use the new knowledge to work out an individual's risk of the condition. The French team from IntegraGen SA hope to have a working risk assessment test on the market by the end of 2006. 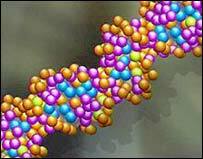 The gene sits on chromosome 16 and holds the DNA code for a protein that plays a central role in brain function. Experts said the Molecular Psychiatry study was promising but that it was premature to talk about an autism test. For their study, the French authors looked at 116 families where at least one member had autism. By analysing the DNA from these individuals they found a region on chromosome 16 - PRKCB1 - appeared to be linked with autism. PRKCB1 is expressed in granule cells in the cerebellum of the brain. Its associated protein is involved in transmitting signals from the granule cells to the Purkinje cells. Both these cells help relay messages in and out of the brain. Researchers have already found a decreased number of both granule and Purkinje cells in the brains of people with autism. Lead researcher Dr Jorg Hager said: "This is the first time that the protein PRKCB1, and the brain functions that it is involved with, have been associated with autism. "We think that this is a significant development." The test they are devising will check for the presence of four genes, including PRKCB1, linked to autism. They envisage that families who already have a child with autism would be able to have their other children tested at an early age - around 18 months. If the cheek swab sample is positive, it means the infant is at increased risk of developing autism and early interventions such as behavioural educational programmes, can be started, said Dr Hager. Around 535,000 people in the UK have an autism spectrum disorder. The condition affects the way people communicate and relate to people around them and sufferers have problems with everyday social interaction. They have a limited ability to develop friendships and find it hard to understand other people's emotional feelings. Other researchers have been attempting to identify genes predisposing people to autism, which are thought to be as many as 20. In 1995 the International Molecular Genetic Study of Autism was set up. It has found areas on chromosome 7 that might be involved. Professor Sir Michael Rutter, an expert in autism at the Institute of Psychiatry, said: "These are interesting and promising findings. We need more studies to confirm them." He did not think it would necessarily be helpful or practical to use the knowledge to develop a risk assessment test because not all of the people with the genes would necessarily develop severe autism. "The real potential for research of this kind is that it can, in conjunction with other research, lead to an understanding of what the disease processes are. In turn, that could lead to new treatments." The National Autistic Society agreed. A spokeswoman said: "If the genes responsible could be identified the possibility of new types of treatment and preventing the more severe manifestations of the disorder becomes stronger." She said a genetic test to diagnose a pre-disposition to an autistic spectrum disorder was not, at present, possible because there were too many genetic and environmental factors involved in the condition.